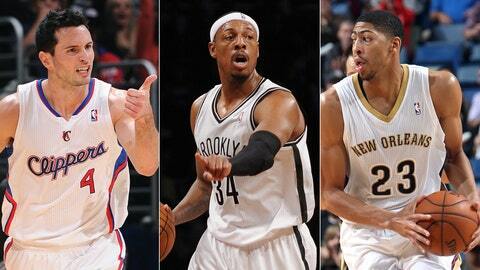 J.J. Redick, Paul Pierce and Anthony Davis are all sidelined. Hands are important in basketball, for fairly obvious reasons. And so the news of hand/wrist injuries to J.J. Redick, Paul Pierce and Anthony Davis has sent significant reverberations through the NBA, with Redick missing 6-8 weeks, Pierce out 2-4, and Davis out 4-6. What’s most interesting, though, about the fact that three different players suffered significant hand/wrist injuries all within days of each other is that they represent an impressive cross-section of the league between them. They’re three guys in incredibly different, highly distinct stages of their careers, stages that many other players also occupy. And they represent where the NBA is at, in many ways, in terms of player development throughout a successful career, as well as the separate joys and opportunities injury can deprive us of. Let’s start with the Clippers’ Redick. As much as any other NBA player, Redick has revitalized not only his career on the court, but also his reputation and persona. Coming out of college, Redick was a hyperarrogant scoring guard whose ability to transition into a tougher, more difficult NBA was widely doubted, but not doubted enough to prevent him from going 11th overall. To say that Redick was reviled as a college player would be to understate the case: he epitomized privilege and the territorialism of college basketball. And when he entered the NBA, people got their wish: he struggled against the stronger, faster competition, failing to thrive on a decreased number of looks in a system that did not highlight him. Except, unlike the typical draft bust/disappointment – and in direct contrast to his counterpart Adam Morrison, who rapidly washed out of the league for a variety of different reasons – Redick realigned himself in accordance with what makes a valuable NBA player. He learned to defend, he learned to come off screens as well as any shooter in the league, and he perfected catching and shooting within a system. Now, in his eighth season, Redick has fashioned himself into a starting two-guard on a playoff-bound team who was scoring a career-high 16 points per game before his injury. And even more surprising, he’s well-liked, popular among basketball fans for his fundamental skill and general lack of flashiness. His injury is a bummer, because it deprives us of the opportunity to see a player who’s at his peak finally thrive. Fortunately, the season is long; Redick will miss a couple months and return, likely in time to help the Clippers toward a top seed in the West. Davis’ situation in New Orleans is entirely different. The No. 1 overall pick last season, Davis had a strong but, to some, disappointing rookie campaign. These people thought him disappointing because he didn’t set the league on fire immediately, which is, of course, an insane thing to expect from any rookie. Davis lost out on Rookie of the Year to Damian Lillard, but he still did about as well as you can expect any rookie big to do, averaging 13.5 points, 8.2 boards, and 1.8 blocks per game on a bad Hornets squad. This season with the Pelicans, though, it was like Davis had evolved into the perfect version of himself. Before his injury, Davis – who is only 20 years old – was averaging 18.8 points, 10.2 rebounds, and 3.6 blocks per game – 3.6 blocks! – was the best, and most established, player on an uncertain Pelicans squad. Davis made that rarest of NBA improvements, the quantum leap; in one offseason, he went from high-potential kid to one of the best players at his position in the league. It’s what happened to Paul George last year. And to lose any time from Davis’ season is an absolute pity, even if, hopefully, it’ll only be a month or so; it certainly brutalizes the Pelicans’ chances of competing in a stacked West. And then there’s Paul Pierce, who is experiencing basically the inverse of Davis’ season. The Nets’ Pierce, a perpetual All-Star and likely future Hall of Famer, is having the worst season of his career. By far. He’s scoring at 10 points below his career average, only managing 12.4 points per game, and his slash line is apocalyptic: .368/.268/.851. In the same way that Davis’ injury reminds us of how great his career will be, Pierce’s injury highlights his precipitous decline. Pierce will be be back relatively soon. But unlike Redick and Davis, who have everything in the world to come back for, for Pierce, it’s only downhill from here.